* 56. 2 pcs. 25 R King Luis = 50 R - cancelled "Lisboa 20 mai 82" on cover sent to Kragerø, Norway. 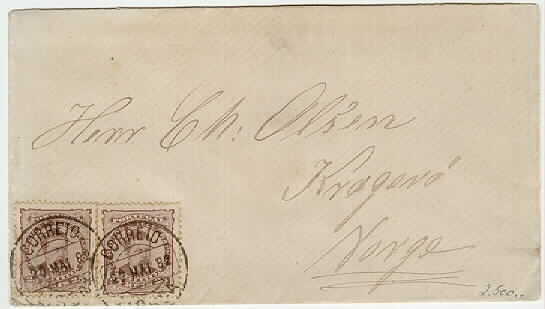 * Michel 103 - 200 Mil‚simas Hispana - horizontal pair = 400 Mil‚simas on a beautiful cover cancelled "Cadiz 17 OCT 1870" sent via Madrid and Sandøsund to Christiania. 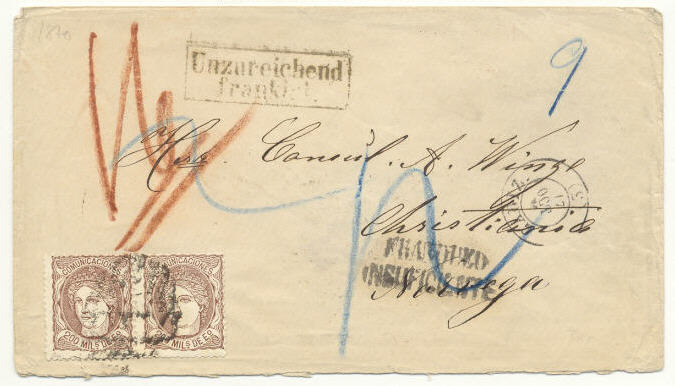 The cover is insufficiently paid and is marked "Unzureichend frankiert" and endorsed "16" with red crayon. A very unusual cover.